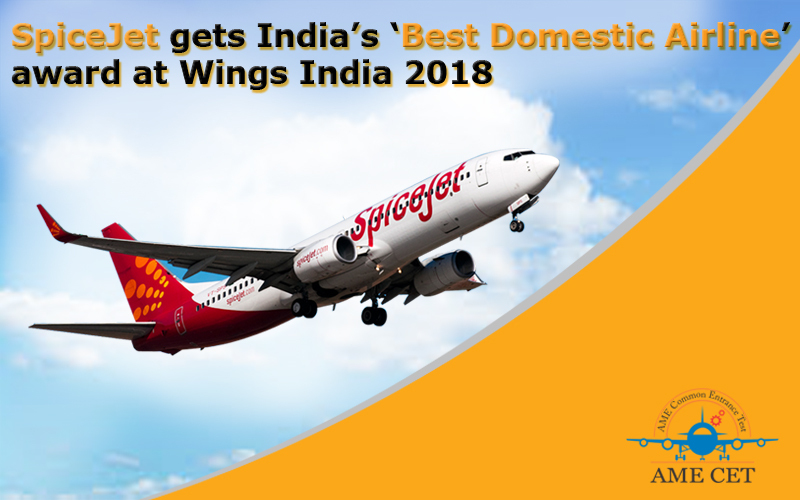 Spicejet was awarded the ‘Best Domestic Airline’ at Wings India being organized by the Ministry of Civil Aviation in the city. The award was given after a jury headed by former Civil Aviation Secretary and Chief Election Commissioner of India, Nasim Zaidi, selected the winner. Ajay Singh, chairman of Spicejet, received the award. The airline has ordered for Boeing 737 aircraft, which are expected to join the Spicejet fleet in August. SpiceJet wants to hold its position in upcoming years, so he is planning to hire more professionals like aircraft maintenance engineer, cabin crew, pilots etc. These technical professional are back bone of aviation industry. “This is recognition of SpiceJet’s spectacular comeback. This award belongs to each and every SpiceJetter who has worked with such passion and dedication in the last three years,” Mr. Singh said. On Friday, Honda Aircraft Company also announced expansion of Hondajet sales to India. Arrow Aircraft Sales and Charters Private Limited have been appointed the sales representative. Also, Air India SATS Airport Services Private Limited was recognised as the ‘Best Ground Handling Service Provider’ and ‘Best Cargo Service Provider’. Chartered flight services provider Club One Air also announced introduction of a Dassault Falcon 2000 plane to its fleet. Chief executive officer of Club One Air said despite problems and hurdles to civil aviation in the country, the Indian aviation industry was positioned robustly. He also said smaller towns and cities in the country were driving the demand for chartered services. On Thursday, Vistara Airlines was named the Most Passenger-Friendly Airline and Telangana was adjudged the Best State with Dedicated Outlook for This Sector. The Indira Gandhi International Airport, New Delhi, won the award for Green and Sustainable Airport, while Chhatrapati Shivaji International Airport, Mumbai, was named the Best Domestic Airport. The awards instituted by Federation of Indian Chambers of Commerce and Industry were given away in 14 categories to spotlight and motivate the sector to improve its performance.